Here's a simple look from my new year's eve. I didn't have any specific plan that night so I decided to just go casual instead ;) I wore brown turtleneck to avoid the cold midnite wind, so to go along with the brown top I was going with a golden brown eyeshadow with metallic sheen for that festive theme, and paired it with sheer bronzer and coral blush-on instead of pink. Nothing really fancy or festive for me because we were just going casual that night. If we were to go to some place nice or had a festive NYE party to attend to, then I would have done a sparkly grey smokey eyes with thick eyeliner and bold lips. But since we were just going casual so I wear a casual makeup too. Here's the products and tools that I used for the look above. So many products to achieve just a simple makeup look. Pretty crazy, right? LOL.. Okay, so for the base I used the Too Faced Beauty Insurance Kit, using the Shadow Insurance as eyelid primer and the Primed Poreless as face primer. And then my choice of foundation is my old Revlon Photoready Airbrush Mousse Foundation in Medium Beige. The unique mousse texture of this foundation goes on smoothly with the help of the Real Techniques Buffing Brush from the Core Collection set. For concealer I used my trusted NYX HD Photogenic Concealer in Yellow, especially on those dark under-eye area of mine. This add brightness to my face, especially after I added the Philosophy Amazing Grace Shimmering Face Powder as additional highlighter on top of my cheeks, on the bridge of my nose, on the cupid's bow, as well as on the forehead. For bronzer I'm using my Wet n Wild bronzer in Goddess, just slightly underneath my cheekbone. I didn't use the brush included in the packaging, I prefer to use the MUA F6 Blusher & Contouring Brush. This is my favorite brush for bronzer because of its slanted shape. For blush-on I'm using my old trusted Too Faced Papa Don't Peach Blush with Real Techniques Blush Brush from the Core Collection. This is a coral blush that is quite pigmented and lasts moderately. I love the coral shade of this blush because it suits my skintone. Last but not least, I added a layer of finishing powder to set everything. I'm using one of my most favorite finishing powder which is the MakeUp ForEver HD Micro Finish Powder that gives instant radiance and soft focus finish, and it also helps set my makeup to last longer. For the eyes, after applying the Too Faced Shadow Insurance primer I put on a base color which is the shade #1 from the Revlon Colorstay 16hr Eyeshadow palette in #545 Attitude. 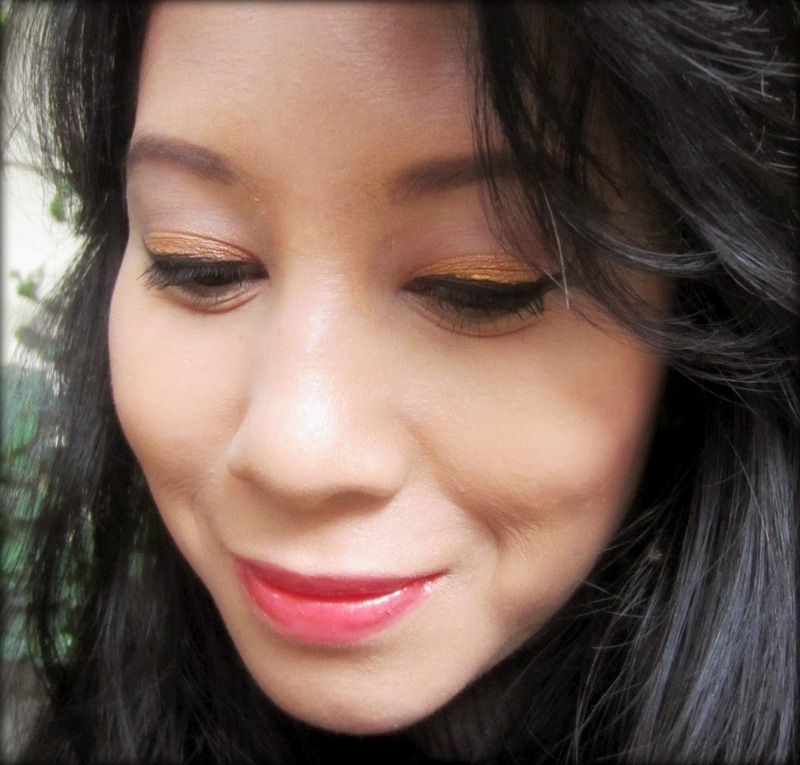 And then I added another eyeshadow which is the creamy Make Up For Ever Aqua Shadow in #26E which is kind of a warm brownish orange shade. And then for a little bit of festive feel I also applied a gold NYX Cream eyeshadow on top of everything. For the transition color I used the shade #2 from the Revlon palette. I also use shade #1 for highlighter under brow bone. Brushes I used to apply eye makeup are the handy eyebrushes from Masami Shouko. Oh I also used a mix of shade #3 and #4 from the Revlon palette above to draw and fill in my eyebrow with the EcoTools eyebrow/eyeliner brush from their Bamboo 5 piece brush set. Last but not least, the choice of perfume for my NYE is my most favorite perfume of 2013 which is the Aigner Debut! You can read my full review about it HERE. 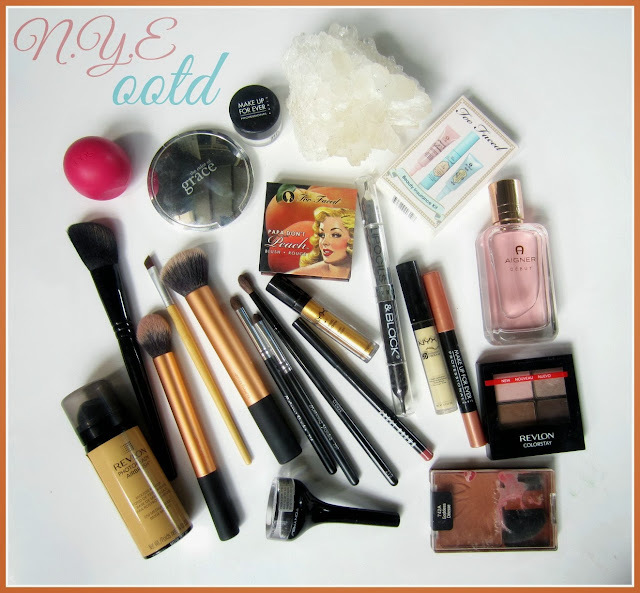 What kind of makeup did you wear for NYE?